While it’s wonderful that public schools offer speech pathology and other occupational therapy, the downside is that summer inevitably comes around, and your child will be without those services for a couple of months. One way to supplement and keep up with your child’s therapy routine is to talk to your home healthcare agency about having a therapist come to your home and continue therapy through the summer. Another fun option is to take your child to summer camp! There are a variety of different camps across Colorado and nation-wide that provide a safe and enriching environment for special needs children. Many camps will focus their offerings on one or a few closely-related needs, to better provide safety, assistance, and enrichment along with the fun. You can check back to our previous blog to learn more or contact Evergreen Home Healthcare to find the right Colorado summer camp for your child. For so many of us, it’s easier to make a quick and instinctive emotional connection with animals than it is with most people. This is why, in recent years, dogs, cats, horses, and even pigs have found purpose in therapy. We’ve had guide dogs for years, of course, but now, dogs can be trained as service animals to help those with emotional issues like severe anxiety or post-traumatic stress. Cats and smaller dogs are being welcomed into nursing homes to offer companionship to elderly with limited mobility. Even smaller pigs can be trained and certified as emotional support animals. 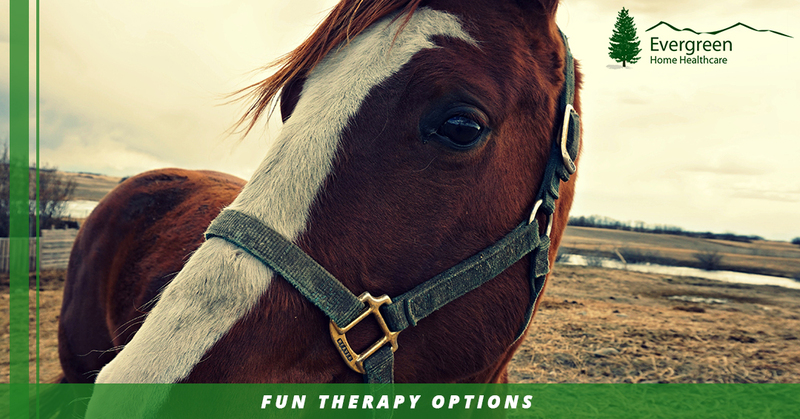 In that same vein, equine therapy offers a way to create connections, work through difficult emotional struggles, and so much more. Equine therapy isn’t necessarily just for those with special needs; however, it’s usually pretty beneficial. The connection between horse and rider is often more conducive to learning skill than during more traditional therapy sessions, whether the need is emotional healing or motor skills. What better way to learn, than through play? Also called therapeutic recreation, this form of therapy is designed to focus on the physical, social, cognitive, and emotional needs of an individual, and isn’t necessarily limited to only children. Recreation therapy, as the name implies, is a way to combine a person’s specific interests and leisure activities with therapeutic techniques to teach skills your child can apply to real-life situations for an overall healthy, balanced life. By using leisure activities to teach, those fun ways to learn skills are more likely to help them throughout life. Unfortunately, your child will eventually age out of school programs; recreation therapy offers a way to have fun and enjoy life while learning and keeping up with the skills to help them with whatever their specific needs are. This way, once your child is no longer eligible for school programs, they will still have learned several skills to keep up a good quality of life. There are enough options for therapy that we couldn’t fit them all into one blog. Stay tuned for our next installment for part two of fun and enriching therapy options. For more information on pediatric health care and more in the Denver area, contact Evergreen Home Healthcare today!